Today, the number of factors that can affect the health of your nerves is greater than ever. That's what makes the RHP® Nerve Support Formula a vital necessity in supporting the health of your nerves. For many people, the ingredients in the RHP® Nerve Support Formula provides enough nutritional support to get them the changes and results they are looking for. Some people may need additional nutritional support to get those same changes and results. The RHP® Advanced Nerve Support Formula was created for them. RHP® Advanced Nerve Support Formula contains vitamins, fatty acids, amino acids, and botanical extracts that have been found to support nerve health. Benfotiamine is better absorbed and retained than most water-soluble B1 vitamins. Methylcobalamin can be taken orally and evidence indicates that it is better absorbed and used more efficiently than cyanocobalamin, the more common form of vitamin B12. 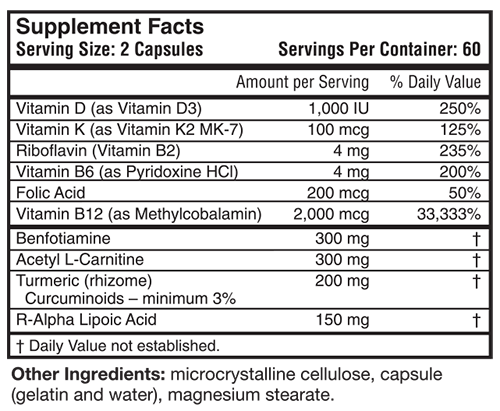 Vitamin K (as Vitamin K2 MK-7) supports the central and peripheral nervous systems. Acetyl L-carnitine, R-Alpha lipoic acid and turmeric help protect nerve cells. 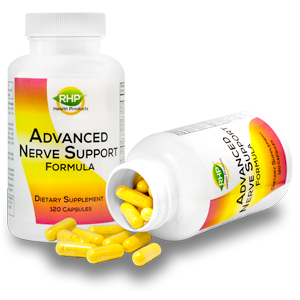 The RHP® Advanced Nerve Support Formula is a product for those people who want to build and support healthy nerves. We're so sure about the quality and effectiveness of the RHP® Advanced Nerve Support Formula, and that you will experience the life changing results, that we offer a 90-day money-back guarantee. A bottle containing 120 capsules is now $52.70. Order your RHP® Advanced Nerve Support Formula below and experience the results for yourself. Order the RHP® Advanced Nerve Support Formula Now!